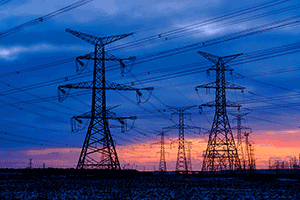 The electric grid of the future is getting closer, thanks to a new public-private partnership. Pacific Northwest National Laboratory and U.S. transmission company National Grid signed an agreement in November 2017 to work together on research in transmission grid modernization and energy storage. Secretary of Energy Rick Perry and Rudy Wynter, President and Chief Operating Officer of National Grid’s FERC-related Businesses, both praised the collaboration. The electricity industry is undergoing sweeping changes, including evolving customer expectations, proliferation of renewable and distributed energy resources, and state energy policies that are affecting what the transmission grid is being asked to do. In view of these challenges, both parties are focused on creating a robust, flexible, secure grid. The shared goal: deliver the nation's clean, reliable, and affordable energy future. This collaboration is important because it joins two powerful forces: one of the nation’s largest energy suppliers and a DOE national laboratory known for developing next-generation power grid technology. National Grid, of Waltham, Massachusetts, supplies energy for more than 20 million people through its networks in New York, Massachusetts, and Rhode Island. It also operates the systems that deliver gas and electricity across Great Britain. In November 2017, National Grid received an award from the National Association of Regulatory Utilities for the company’s Natural Gas Demand Response Program. The program uses advanced technology to help commercial and industrial customers automatically reduce their gas energy usage during the coldest winter days, when demand is highest. PNNL plays key leadership and research roles in DOE's Grid Modernization Laboratory Consortium, which is delivering new concepts and technologies to better measure, analyze, predict, and control the future power grid. Under the DOE Office of Electricity Delivery and Energy Reliability Energy Storage Program., PNNL is leading the development of next-generation technologies and tools that will enable greater deployment of grid-scale energy storage. PNNL's research in vanadium redox flow batteries has led to technology licensed by eight companies. And PNNL's grid cyber research includes work to establish information-sharing capabilities for grid business information technologies, providing situational awareness of cyber risks for the nation's utilities. In fall 2017, PNNL grid experts testified before Congressional committees on grid-scale research, as well as electric infrastructure resilience and grid cybersecurity.